Mountain Bluebird: Ralph Hocken Photo. The Tuesday bird walk went to the Englishman River Estuary on the Shelly Road side. The morning was cloudy with light winds. We heard a Red-breasted Sapsucker tapping on a tree near the parking area at the start of the walk but were not able to spot it. However, we did see it near the end of the walk as we neared the parking area when it flew and perched on a snag not far from us. 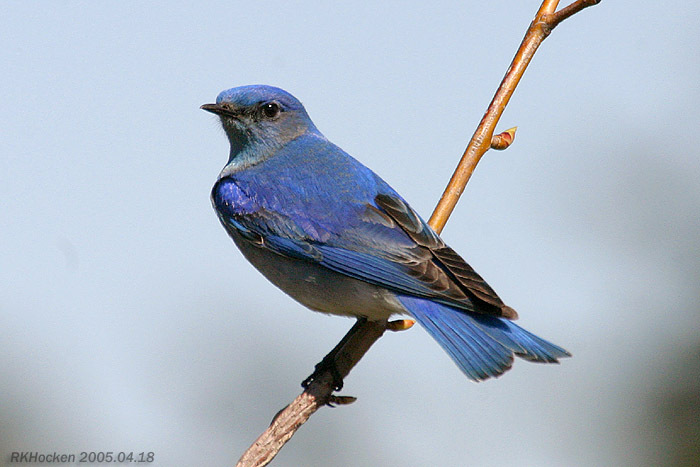 The big highlight of the morning was the sighting of a Mountain Bluebird. We spotted the Bluebird perched in a short shrub in the meadows and watched it for about 30 minutes as it hawked insects and returned to it's perch. We also saw a Northern Shrike perched on a snag close to the R.V. Park behind the meadows. Two Yellow-rumped Warblers were seen--one flying over the Englishman River and another on the bushes along the bank of the river. 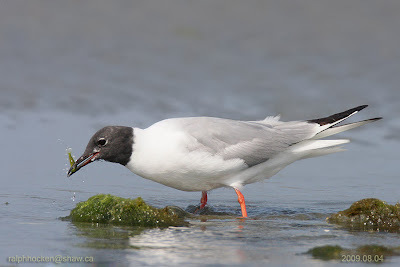 Bonaparte's Gull Ralph Hocken Photo. The Sunday bird walk went to the Shelly Road side of the Englishman River Estuary in Parksville. The morning was cloudy with strong winds. The highlight of the morning was the sighting of massive numbers of the following Gulls--Bonaparte's Gulls, Mew Gulls, California Gulls, Thayer's Gulls, Herring Gulls and Glaucous-winged Gulls. An Anna’s Hummingbird was perched on top of a shrub giving us great looks. Canada Goose, Brant, Eurasian Wigeon, American Wigeon, Mallard, Northern Pintail, Green-winged Teal, Greater Scaup, Surf Scoter, White-winged Scoter, Black Scoter, Long-tailed Duck, Bufflehead, Harlequin Duck, Common Goldeneye, Barrow's Goldeneye, Red-necked Grebe, Horned Grebe, Common Merganser, Red-breasted Merganser, Common Loon, Double-crested Cormorant, Brandt’s Cormorant, Pelagic Cormorant, Great Blue Heron, Turkey Vulture, Bald Eagle, Cooper’s Hawk, Killdeer, Dunlin, California Quail, Bonaparte's Gull, Mew Gull, California Gull, Thayer's Gull, Herring Gull, Glaucous-winged Gull, Pigeon Guillemot, Belted Kingfisher, Anna’s Hummingbird, Northern Flicker, Pileated Woodpecker, Steller’s Jay, Northwestern Crow, Common Raven, Chestnut-backed Chickadee, Red-breasted Nuthatch, Bushtit, Pacific Wren, Bewick’s Wren, Ruby-crowned Kinglet, Golden-crowned Kinglet, American Robin, Varied Thrush, European Starling, Spotted Towhee, Song Sparrow, Golden-crowned Sparrow, Dark-eyed Junco, and Purple Finch. One female Pine Grosbeak was seen perched on top of a fir tree near Morrell Circle in Nanaimo. Over one hundred Trumpeter Swans were spotted flying over the Morningstar ponds in Parksville. An Osprey was seen on a high tree branch down the public access trail off Stevenson Point Road in Nanaimo. A Rufous Hummingbird was seen at a feeder in the 100 block of Gulfview Drive in Nanaimo. Turkey Vultures were seen over the Ugly Dwarf Meadows near the ESSO Station at Nanoose Bay. Violet-green Swallows, Tree Swallows and Yellow-rumped Warblers were seen at the Morningstar Ponds in Parksville. 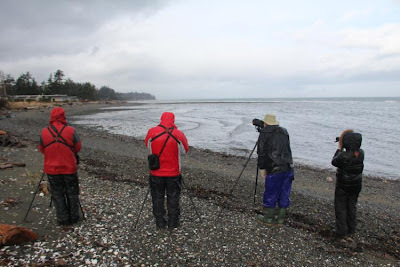 The Tuesday bird walk went to Parksville Bay and Rathtrevor Provincial Park in Parksville. The morning was cloudy with sunny periods and the wind was calm for most of the morning. Ten Trumpeter Swan's flew over heading up island. 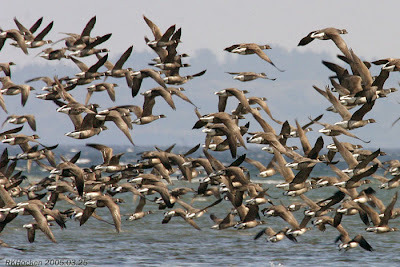 Hundreds of Brant Geese flew in and landed near the tide line. Thousands upon thousands of Gulls were along the shoreline for most of the morning. We were able to closely observe Bonaparte's Gulls, Mew Gulls, California Gulls, Thayer's Gulls, Glaucous-winged Gulls, two Herring Gulls, a Western Gull, and a Glaucous Gull. 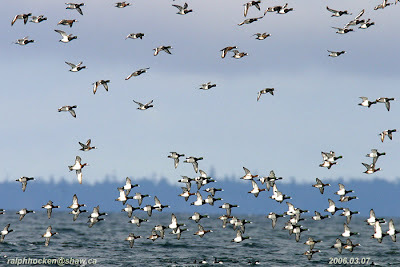 We saw thousands of Eurasian Wigeon, American Wigeon, Northern Pintail, Greater Scaup, Harlequin Duck, Surf Scoter, White-winged Scoter, Black Scoter, Long-tailed Duck , Bufflehead, Common Goldeneye and Barrow's Goldeneye in a hugh moving raft off Parksville Bay. Common Loon, Horned Grebe, Red-necked Grebe, Double-crested Cormorant, Pelagic Cormorant, Great Blue Heron, Bald Eagle, Merlin, Black Oystercatcher, Bonaparte's Gull, Mew Gull, California Gull, Herring Gull, Thayer's Gull, Western Gull, Glaucous-winged Gull, Glaucous Gull, Northern Flicker, Pileated Woodpecker, Northwestern Crow, Common Raven, Chestnut-backed Chickadee, Red-breasted Nuthatch, Brown Creeper, Pacific Wren, Ruby-crowned Kinglet, American Robin, Varied Thrush, European Starling, Spotted Towhee, Song Sparrow, White-crowned Sparrow, Dark-eyed Junco. A Red-tailed Hawk was seen soaring over the Chase River overpass on Highway 19 in Nanaimo. Two Bewick’s Wrens, one Varied Thrush and a flock of Pine Siskins were visiting a backyard feeder in the 2700 block of Neyland Road in Nanaimo. Over fifteen Yellow-rumped Warblers were seen at Buttertubs Marsh in Nanaimo. The resident Short-eared Owl, three Northern Harriers, a small flock of Tree Swallows, a Western Meadowlark and a Lincoln's Sparrow were seen at the Nanaimo River Estuary in south Nanaimo. A Common Teal, a flock of Green-wing Teal, twelve Northern Shovellers, Northern Pintail, a Lesser Scaup, Mallards, Canada Geese and American Wigeon were seen on Quesnell Lake. A very large mixed flock of Tree Swallows, Violet-green Swallows were hawking insects over the back stretch of Quesnell Lake. Five California Quail were visiting a backyard in the 2800 block of Skrimshire Road in Shawnigan Lake. A Saw-whet owl was spotted in yard on Benson View, near Witchcraft Lake in Nanaimo. Monday March 28, 7.30 pm at Springwood School in Parksville. Guest Speaker-Bill Merilees will speak on Mega herbs of Sub-Antarctic. Thursday, April 14, 7 pm in the Library on Northwest Bay Road. The Tuesday Bird Walk on March 29, 2011 will be going to the Shelly Road side of the Englishman River Estuary in Parksville. We will meet at the Parksville Beach Community Park at the parking area in front of the Lions Playground at 9 A.M. or at the end of Shelly Road on the Oceanside of Highway 19a at about 9:15 A.M. The Sunday Bird Walk, April 03, 2011 will be going to Neck Point in Nanaimo. We will meet at the Backyard Store at 9:00A.M. or at the parking lot at Neck Point off Hammond Bay Road at about 9:20A.M. For the 18th year a Big Day competition will be held to crown the teams that can see the most species of birds in one day. WHERE: Parksville/Qualicum Beach, Vancouver Island, BC. WHEN: Saturday April 9, 2011 from 4:30am to 3:00pm. WHO: Teams of 3 to 5 in both Green and Motorized Categories. Novice, Intermediate, Experienced & young birders all welcomed. PRIZES: Awards Presentations immediately following at Deez Bar & Grill, Qualicum Beach. COST: $10 cash per person at the door. HOW: TO REGISTER, contact RHYS HARRISON rhysharrison@shaw.ca or (250) 248-5305 with team names, category & experience level. PROCEEDS: To the BRANT WILDLIFE FESTIVAL. DETAILS: Instructions, Map, Checklist & Suggested Hotspots will be emailed to Team Members on registration. Space may be limited so register early. Singles & Couples are encouraged to enter and will be helped to form a team. Several special prize categories have been added this year. Bonapart's Gull: Ralph Hocken Photo. The Tuesday Bird Walk on March 29, 2011 will be going to the Shelly Road side of the Englishman River Estuary in Parksville. We will meet at the Parksville Beach Community Park at the parking area in front of the Lions Playground at 9 A.M. or at the main parking lot at end of Shelly Road on the Oceanside of highway 19a at about 9:15A.M. Greater Scaup in flight: Ralph Hocken Photo. Short-eared Owl: Ralph Hocken Photo. Please remember, when reporting a sighting to leave your name and phone number, along with the date, the species and location of your sighting. The Sunday bird walk went to the Nanaimo River Estuary. The morning was cloudy with sunny periods and strong winds. The highlight of the morning was the sighting of a Golden Eagle in with Bald Eagles on the ground not far from us. 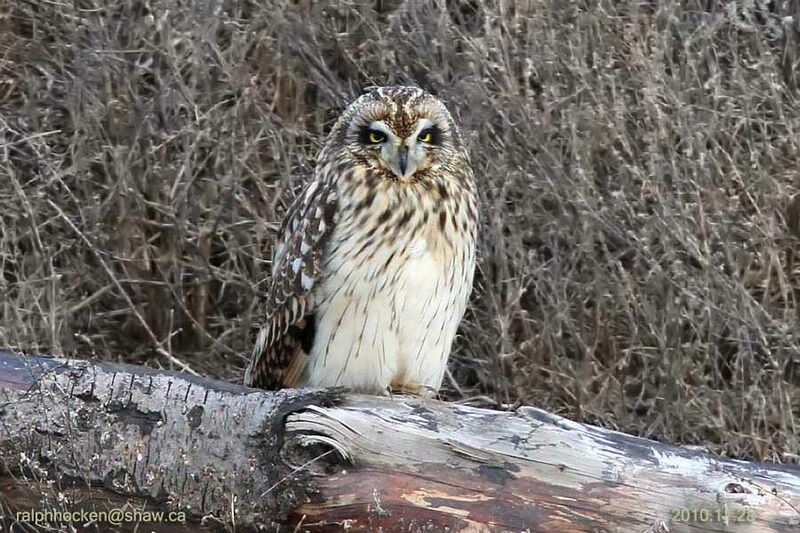 We saw a Short-eared Owl and a Northern Harrier hunting low over the Estuary. Canada Goose, Great Blue Heron, Mallard, Common Mergansers, American Wigeon, Northern Pintail, Green-winged Teal, Glaucous-winged Gulls, Golden Eagle, Bald Eagle, Short-eared Owl, Northern Harrier, Red-tailed Hawk, Northern Flicker, Common Raven, Tree Swallows, Belted Kingfisher, American Robin, European Starling, Spotted Towhee, Fox Sparrow, Golden-crowned Sparrow, Dark-eyed Juncos and American Goldfinch. A Yellow-rumped Warbler was seen in a backyard along Andover Road in Nanoose Bay. Four Evening Grosbeaks were seen feeding on a Big-leaf Maple Tree on Protection Island. A Downy Woodpecker is visiting a suet feeder in a backyard in the 5900 block of Tweedsmuir Crescent in Nanaimo. A Cooper’s Hawk was seen perched in a tree above a bird feeder in a backyard along Glenayr Drive in Nanaimo. A Great Horned Owl was seen along Linley Road in Nanaimo. The first Rufous Hummingbird of the season is visiting a feeder along Fawcett Road in Cedar. Tree and Violet-green Swallows, a Barn Swallow, Gadwall and a Northern Harrier were seen at the Nanaimo River Estuary in south Nanaimo. A Rufous Hummingbird is visiting feeders along Sandpiper Place in Nanaimo. Eight Trumpeter Swans and thirty Canada Geese were spotted flying north over the 2500 block of Glenayr Drive in Nanaimo. 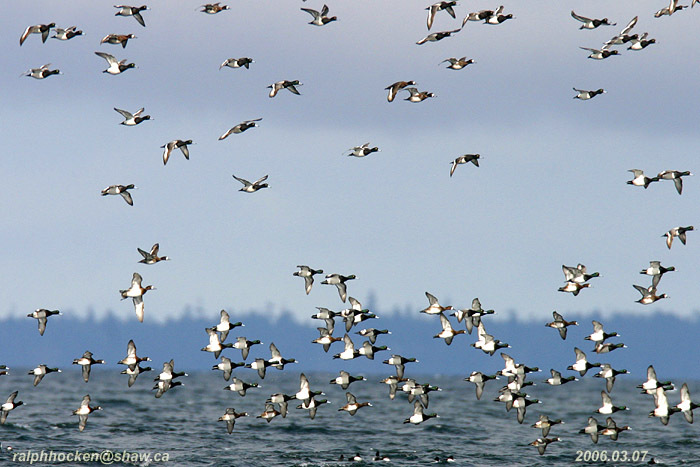 Black Scoters, Long-tailed Ducks, Bufflehead, Common Goldeneye, Barrow's Goldeneye and Brant formed a massive moving raft offshore from the hovercraft landing pad at Parksville Beach. Five very wet birders saw and heard the following forty-one species of birds. Thayer's Gull, Glaucous-winged Gull, Rock Pigeon, Eurasian Collared Dove, Northern Flicker, Northwestern Crow, American Robin, European Starling, Spotted Towhee, Song Sparrow, White-crowned Sparrow, Dark-eyed Junco and House Finch. 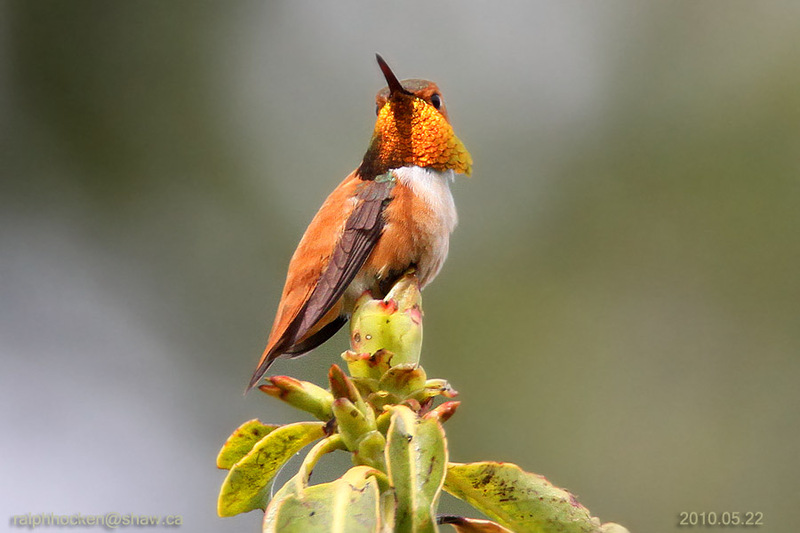 Rufous Hummingbirds are visiting feeders near Wembley Road and Yellow brick Road in Parksville. Two Great Horned Owls were seen at Yellow Point Park in Cedar. 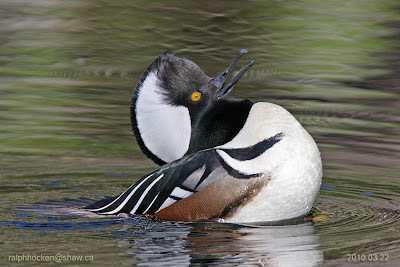 The Tuesday Bird Walk on March 22, 2011 will be going to Rathtrevor Provincial Park in Parksville. We will meet at the Parksville Beach Community Park at the parking area in front of the Lions Playground at 9 A.M. or at the main parking lot at Rathtrevor Provincial Park. at about 9:15A.M. Please note there is a parking fee. The Sunday Bird Walk, March 27, 2011 will be going to the Plummer Road side of the Englishman River Estuary in Parksville. We will meet at the Backyard Store at 9:00A.M. or at the corner of Plummer Road and Shorewood Drive at about 9: 30 A.M.
Top Photo--Winter Storm Watch birders: Marie Sprandel Photo. Bottom Photo--Brant in flight: Ralph Hocken Photo. Due to the weather, the Sunday bird walk to the Nanaimo River Estuary was postponed until March 20th. A Rufous Hummingbird was spotted near Dover Bay and Dickinson Road in north Nanaimo. Hundreds of Long-tailed Ducks, Greater Scaup, Surf, Black and White-winged Scoters were in a raft not far from shore at Columbia Beach. There were thousands of gulls along the shoreline at Columbia Beach. The annual Herring Spawn has begun! About thousand Brant were seen lifting from the tideline and then settling down again off Johnstone Road near French Creek. A Rufous Hummingbird was visiting feeders in the College Heights area of Nanaimo. Two Barred Owls were calling from a tree top at the Colliery Dam Park in Nanaimo. The Tuesday bird walk went to the Little Qualicum River Estuary near Qualicum Beach. The morning was cloudy with a brisk wind and a bit of sun throughout the morning. Gulls flew overhead all morning. 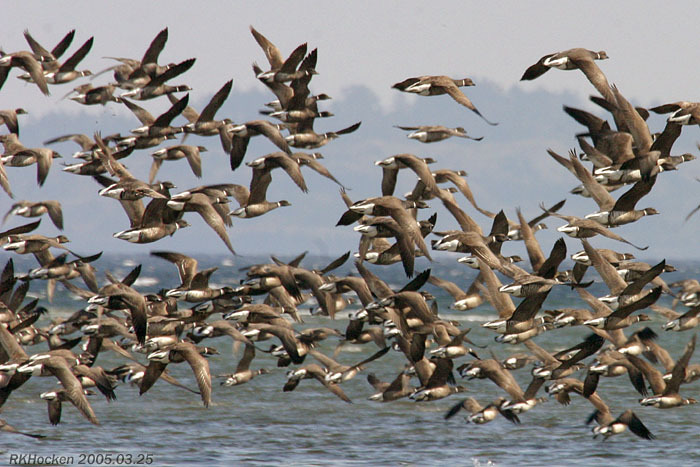 We saw over four hundred Brant Geese near shore at the viewing platform in Qualicum Beach. Black Oystercatchers and Black Turnstones were also along the shoreline. Red-throated Loons, Pacific Loons, Common Loons, Horned Grebes and Red-necked Grebes were further offshore. A Sharp-shinned Hawk was perched along the Little Qualicum River at the estuary on a tall snag giving us great looks. A large raft of Surf Scoters, Black Scoters, White-winged Scoters and Greater Scaup were seen near the gravel bar. Seventeen birders saw and heard the following forty-five species of birds. Northwestern Crow, Common Raven, Chestnut-backed Chickadee, American Robin, European Starling and Red-winged Blackbird. An American Kestrel was seen along the Yellowpoint Road near the Crow & Gate Pub in Cedar. An American Pipit was spotted at Morrell Circle and Nanaimo Lane near Morrell Sanctuary in Nanaimo. A small flock of Red Crossbills were spotted flying above the houses along the 800 block of Harewood Mines Road in Nanaimo. Four Red Crossbills were seen in the trees at the junction of the Island Highway and Harewood Mines Road. 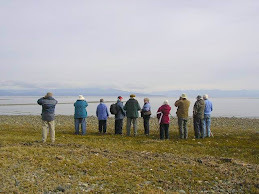 The Tuesday Bird Walk on March 15, 2011 will be going to Columbia Beach. We will meet at the Parksville Beach Community Park at the parking area in front of the Lions Playground at 9 A.M. or at the parking area along Admiral Tryon Blvd. at about 9:20A.M. (Turn off Highway 19a at Columbia Drive on the Oceanside of the highway go to Admiral Tryon Blvd. Turn right go about 100 yards and turn left into the parking area. The Sunday Bird Walk, March 20, 2011 will be going to the Nanaimo River Estuary. We will meet at the Backyard Store at 9:00A.M. 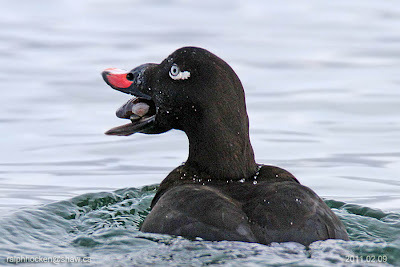 or at end of Raines Road at about 9: 30 A.M.
White-winged Scoter: Ralph Hocken Photo. Hooded Merganser: Ralph Hocken Photo. along with the date, the species and location of your sighting. The Sunday bird walk went to Buttertubs Marsh in Nanaimo. The morning was cloudy and cool, with light rain. The sun did come out for part of the morning. The bird songs of spring highlighted the morning---the Marsh Wrens, Song Sparrows, Bushtits, Golden-crowned Kinglets, Ruby-crowned Kinglets, Anna's Hummingbirds American Robins, Varied Thrush, Red-winged Blackbirds, American Goldfinch and Chestnut-backed Chickadees were singing throughout the morning. Seven Evening Grosbeaks were seen in a tall maple tree along Dawkins Lane in Nanaimo. The Tuesday bird walk went to the Shelly Road side of the Englishman River Estuary. The morning was cool and cloudy, but the rain held off. We were fortunate enough to see a large flock of Evening Grosbeak high in the trees near the parking area. As well, there was a Northern Shrike spotted sitting atop a tree in the meadow area. Special thanks to John for leading the walk and to Rhonda for the tally. Song Sparrow and House Finch. A possible female Western Tanager was seen on sun-deck rail this morning and later seen in a Dogwood tree across the parking lot at the west end of Dingwall Street area in Duncan. A pair of Golden-crowned Sparrows were seen visiting feeders along Meridian Way in Parksville. An American Kestrel was spotted on hydro lines and a White Albino Raven was perched in a tree along Headquarters Road just north of Bridges crossroad near Oyster River. Thursday, March 10th, 7 pm in the Library on Northwest Bay Road. Guest Speaker Ron Tanasichuk, will be sharing results from the Neptune Project: "The Biology of Herring & Salmon Population Fluctuations in Southern BC". 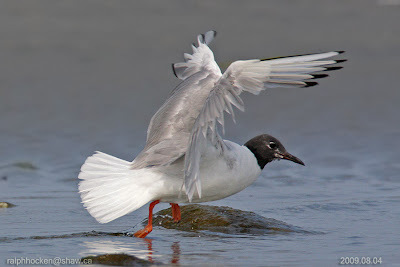 The Tuesday Bird Walk on March 08, 2011 will be going to the Little Qualicum River Estuary. We will meet at the Parksville Beach Community Park at the parking area in front of the Lions Playground at 9 A.M. or at viewing platform near Garrett Road and highway 19a at about 9:20A.M. The Sunday Bird Walk, March 13, 2011 will be going to the Nanaimo River Estuary. We will meet at the Backyard Store at 9:00A.M. or at end of Raines Road at about 9: 30 A.M. Remember that the clocks spring ahead an hour at 2 a.m. Sunday Morning! 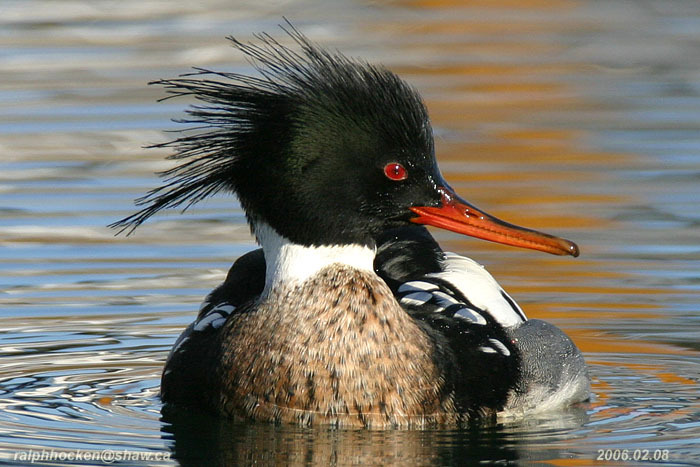 Red-breasted Merganser: Ralph Hocken Photo.